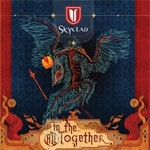 The newest Skyclad album In The�All Together is a bit of a tough one for me to review. As with all of their last several releases I find myself wanting to like it more than I actually do. Those of us who remember searching for decent metal in the early-mid nineties latched on to handful of bands that remained true to what we considered to be "real metal" or "good metal." For me, one of those bands was Skyclad. I still think some of their early stuff is some of the most original and well-written metal of all-time. But the metal resurgence hit at the same time Skyclad's lyrics went from clever to corny � around the Vintage Whine and Folkemon albums � and like a lot of early fans I couldn't help but lose interest. And while I have heard all subsequent Skyclad releases, none have captured my interest enough to want to really get to know them. In The�All Together did spark some interest upon the first listen. Opening track Words Upon The Street, and other rockers like Black Summer Rain are some of the crunchiest tunes I've heard from these guys (and gal) in a while. Others like Babakoto sound more like the early folk stuff reminiscent of Jonah's Ark � my personal Skyclad favorite. After a few more runs through this disc though, other songs like Still Small Beer and The Well-Traveled Man stick out a little more. These remind me more of the cornier Skyclad recordings, or even like some old-time tavern sing-alongs - not the kind of songs that sound like they belong on a metal album. In a nutshell, In The�All Together leaves me with mixed feelings. There is certainly some value here, but as a whole its easy to tire of this album fairly quickly. The better tracks are worth sending to your IPOD and listening to regularly, but the weaker tacks need to be scrapped all together. In a nutshell, In The�All Together leaves me with mixed feelings. There is certainly some value here, but as a whole its easy to tire of this album fairly quickly.